IN the twilight of the 1980s, Bill Flanagan, a writer with Musician magazine, offered a refreshing and prescient prophecy when asked to navigate uncertain waters and speculate who would be making waves in the near future. The lesson of the Reagan years, wrote Flanagan, was that “musical trends are now shaped more by delivery systems than any act”. Rather than name-checking any up-and-coming young bands as the future, he went down a different route altogether. “The next Beatles may be a technology,” he surmised. Even he, though, would have been forgiven for scoffing if told that three decades on, two of the biggest musical events would involve the way the The Beatles’ music was being remastered, repackaged, and reissued for a new audience. Those events – the release of a special Rock Band video game, and the acquiescence of various estate holders to allow the Fab Four’s music to appear on iTunes – warranted publicity aplenty, yet short of rudimentary sonic airbrushing, presented recordings first committed to tape nearly half a century ago. Such offerings, according to music critic Simon Reynolds, are part of a recycling process, one which has become noticably more pronounced since the millennium, a period when “time itself seemed to become sluggish, like a river that starts to meander and form oxbow lakes”. In Retromania, an ambitious and thoughtful analysis of “what happens when we run out of past,” Reynolds is following a well-trodden route of writers who have bemoaned popular’s music’s exhausted potential. A similar case was put forward over a decade ago by James Miller, the author of Flowers in the Dustbin, who declared that rock and roll’s evolutionary process eventually destroyed the very musical sources of its own vitality, with 1977’s punk explosion the “final act”. Reynolds, whose previous works include Rip it Up and Start Again and Energy Flash, always has music as his focus, but blends critical theory, historical thinking, and politics into the mix, a brew rendered palatable by his rewarding essay style. As his previous works demonstrated, his musical knowledge is expansive, and Reynolds even sticks his neck out to highlight a specific period and set of groups he believes responsible for giving impetus to the fascination with what had gone before. It began in earnest, he suggests, in the 1980s with groups such as The Jesus and Mary Chain, Primal Scream, and Spacemen 3, before the lineage continued through the likes of Lenny Kravitz, The Black Crowes, Oasis, The White Stripes, Interpol and Goldfrapp. Whether you judge his call to be right or wrong – personally, I would point the finger at the glam rock movement as the earliest “retro” era, while 1968’s The Beatles (commonly known as the White Album) consciously harked back to past musical styles – Reynolds makes a lucid point that the era he chose heralded the end of artists looking to “create something never heard before”. Instead, he reasons, that drive “changed into an impulse to create something very much heard before, and moreover to do it immaculately, accurate in every last detail”. Reynolds has a keen and discerning eye for the facetious and torpid nature of modern culture’s relationship with the recent past, reserving especial scorn for the splurge of television clip shows devoted to specific decades which dominated the schedules in recent years. At times, however, his critical faculties give way to supercilious rants about certain musical genres, and interestingly, the way people listen to them. In Reynolds’s eyes, the now ubiquitous MP3 served to turn music into a “devalued” currency, which “flowed into people’s lives like a current or fluid [and] made music start to resemble a utility (like water or electricity) as opposed to an artistic experience whose temporality you subjected yourself to”. While the significance the author accords to recorded music is admirable, he is all too often in danger of coming over as a vinyl bore in the pub, wondering if the jukebox selection includes dance music. So too, he presents occasional apocryphal tales from rock lore as gospel, rehashing without question the account of how Lee Mavers, the perfectionist frontman with The La’s, refused to record with a mixing desk unless it had “original Sixties dust on it”. A greater crime, however, is his trite views of modern technology and habits. YouTube, for instance, is chastised for the varying quality of content it provides – a curious criticism indeed, akin to condemning all music simply because you care little for the cassette – while Reynolds also condemns out of hand the “mash-up” as a “blood-sugar blast of empty carbohydrate energy”. So too, he bemoans the youth of today, claiming that their “attachment to genres that have been around for decades” leaves him “mystified”. For all his perceptive points, this middle-aged (he is 48) angst and frustration is Reynolds’s downfall, as he endlessly insists upon the vitality of the “new” without considering what’s quite so wrong with the “old” in the first place. 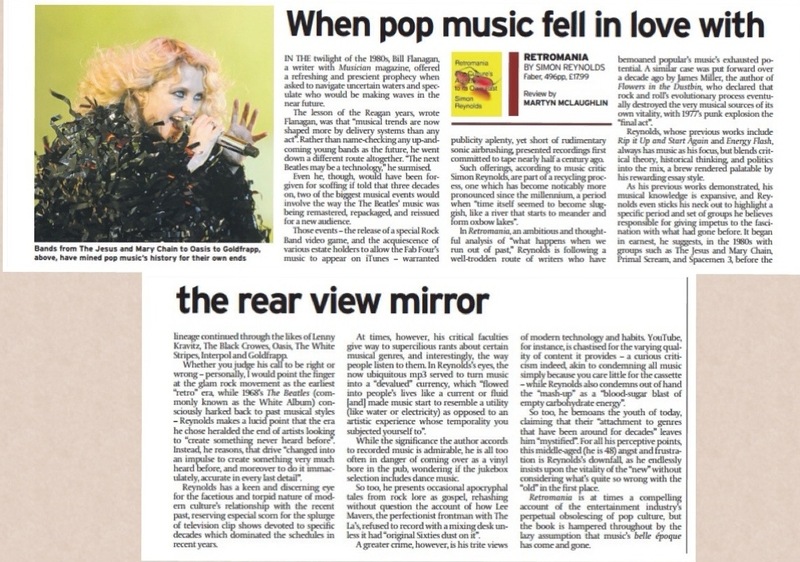 Retromania is at times a compelling account of the entertainment industry’s perpetual obsolescing of pop culture, but the book is hampered throughout by the lazy assumption that music’s belle epoque has come and gone.